Use of finance in a certain form has been present and operational since the emergence of the world’s first civilizations such as: Egypt, Greece, Babylon, Rome and others. At that time, however, the financial system was primarily based on archaic stores of value - gold or silver money. In its basic definition, finances were created with the concept of money and the development of its functions as a payment and transactional mechanisms. Where there is no money, there is no value. Money is the determinant, but also the function of finance. The development of finance as a science and its function relates to the emergence of the state, since it is the primary creator and backer of money. In this regard, public-state finances first began to be studied, followed by other financial disciplines. Whereby the equilibrium arises from the payment of debt, collection of claims between states, enterprises and individuals. 1. Bean, J. (2003). Engineering Global E-Commerce Sites. San Francisco: Morgan Kaufmann Publishers. 2. Burn, M. J., & Ash, G. C. (2001). Managing Changefore - Business Success. Slovenia, Bled: 14th Bled Electronic Commerce Conference, 25-26. 3. Collison, S. (2006). Beginning CSS Web Development: From Novice ti Professional. New York: Springer-Verlag. 4. Ciric, M., Ciric, M., Kuzman, B., & Zekavica, A. (2018). Farmer innovativeness and its impact on internet and social media adoption Economics of Agriculture 1/2018 Vol. 65, No. 1, Scientifc Society of Agricultural Economists of the Balkans, Belgrade, pp. 243-256. 5. Hoffman, D. L., & Novak, T. P. (2000). How to Acquire Customers on the Web. Harvard Business Review, No 3, pp. 179-188. 6. Humphrey, J., Mansell, R., Paré, D., & Schmitz, H. (2003). The Reality of E-commerce with Developing Countries. United Kingdom: Institute of Development Studies at the University of Sussex. 9. Jovanovic, R., & Milovanovic, S. (2010). E-Commerce, Niš, Faculty of Economics in Niš, [in Serbian: Јовановић, Р., & Миловановић, С. (2010). Електронско пословање, Ниш: Економски факултет]. 10. Marjanovic, A. (2008). E-business - seminar work. Belgrade: Faculty of Organizational Sciences, [in Serbian: Марјановић, А. (2008). Електронско пословање - семинарски рад. Београд: Факултет организационих наука]. 11. Micic, I., Rajic, Z., & Micic, I., I. (2017). 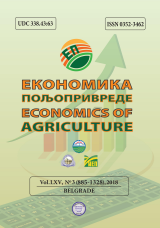 Strategic Risk and Payments in Electronic Banking, Scientifc Society of Agricultural Economists of the Balkans, Belgrade, [in Serbian: Мичић, И., Рајић, З., & Мичић И. И. (2017). Стратешки ризик и плаћања у електронском банкарству]. 12. Milicevic, V. (2002). Internet economy. Belgrade: Faculty of Organizational Sciences, [in Serbian: Милићевић, В. (2002). Интернет економија. Београд: ФОН]. 13. Milojević, I., Ignjatijević, S., & Micic, I. (2017). The application of Markov’s Stochastic processes in risk assessment for accounting information systems, UDC 657.4, Economics of Agriculture, Vol. 64, No. 2, Scientific Society of Agricultural Economists of the Balkans, Belgrade, pp. 551-560. 15. Schiller, D. (2000). Digital Capitalism – Networking the Global Market System. England, London: The MIT Press. 16. Schwartz, E. (1997). Webonomics - Nine Essential Principles for Growing Your Business on the World Wide Web. England: Penguin Books. 17. Serour, M. K., & Henderson-Sellers, B. (2004). Organizational Aspects of Transformation to E-Business: A Case Study. Sydney: University of Technology, IADIS International Conference e-Society. 18. Shapiro, C., & Varian, R. (1998). Information Rules, A Strategic Guide to the Network Economy. Boston Harvard Business School Press. 19. Sharma K. S., & Kitchens F. (2003). Assessing Technology Integration for E-business. South Australia, Adelaide: 7th Pacific Asia Conference on Information Systems, 10-13. 20. Shaw M. (2002). E-Business Management: Integration of Web Technologies with Business Models. Series: Integrated Series in Information Systems, Vol.1. 21. Stojanovic, М. (2008). Elektronic Business in culture – thesis. Belgrade: Faculty of Organizational Sciences, [in Serbian: Стојановић, М. (2008). Електорнско пословање у култури - дипломски рад. Београд: Факултет организационих наука]. D. MIČIĆ, Ivan; TOTIĆ, Ibrahim; HALILAGIĆ, Ahmet. FINANCIAL MANAGEMENT IN FOOD ENTERPRISES AND GLOBALIZATION OF ELECTRONIC BUSINESS IN SERBIA. Economics of Agriculture, [S.l. ], v. 65, n. 3, p. 1259-1276, sep. 2018. ISSN 2334-8453. Available at: <http://ea.bg.ac.rs/index.php/EA/article/view/896>. Date accessed: 19 apr. 2019. doi: https://doi.org/10.5937/ekoPolj1803259M.